Strange comic book fans, rejoice! Your hero has finally made it into the Marvel Cinematic Multiverse and with that comes the potential of reboots aplenty. The shenanigans we saw in J.J. Abrams’ Star Trek movies and the X-Men series may now lie ahead for the Main Marvel Line. Future implications aside, however, Doctor Strange tells a standard tale with just enough cleverness to keep the viewer interested. It is, in superhero parlance, an “origin story” and, as with all episodes falling into that category, it is saddled with a number of obligatory elements. Because the movie is tasked with telling us how the main character (played with panache by Benedict “Sherlock” Cumberbatch) becomes the Master of the Mystic Arts, the movie has limited flexibility to do other things. The villain, Kaecilius with the purple eyeshadow (Mads Mikkelsen), is not terribly intimidating. He looks more like a glam rocker than a bringer of darkness. Of greater interest is Kaecilius’ cosmic boss, Dormammu (Cumberbatch again, doing double duty as he did in The Hobbit trilogy), whose special effects-intensive appearance suggests how Marvel might consider rendering Galactus (if they ever get the rights back from Fox). Dormammu doesn’t have a lot of screen time but his confrontation with Strange allows the narrative to try something new (at least insofar as superhero/supervillain confrontations go). Doctor Strange opens with the introduction of the brilliant but arrogant neurosurgeon Stephen Strange, whose professional skills make him one of the most desired doctors in New York City but whose interpersonal skills (or lack thereof) turn a lot of people off. One evening, while driving his car too fast and paying too little attention to the road ahead, he becomes the victim of a brutal crash. He survives but his hands are shredded. The nerve damage guarantees that he’ll never practice medicine again. Desperate for any strand of hope, he travels to a monastery in Nepal where he trains under the tutelage of The Ancient One (Tilda Swinton) and her disciple, Mordo (Chiwetel Ejiofor), learning how to bend reality, control time, and create alternate universes. This is all in preparation for the showdown with Kaecilius and Dormammu, which comprises the final act. This is a highly special effects-intensive feature. There are times when the visuals are dazzling and dizzying but there’s also a sense that we’re watching something created on a computer as opposed to a genuine bending of reality. Possibly influenced by Christopher Nolan’s Inception, these scenes also recall the “unreality” of the inside-the-computer realm from the TRON films. They also contribute to one of the most inventive chase scenes in recent motion picture memory in which characters appear to be fleeing through a landscape designed by M.C. Escher, with recursive paths that double back on themselves and where the laws of physics no longer hold sway. Although 3-D IMAX admittedly enhances the film’s look (the 3-D is well rendered and not infected with many of the usual problems), it’s questionable whether it’s worth the surcharge. This is not a transformative 3-D experience. It’s more in the nature of a slight improvement. One of the reasons why Doctor Strange works is the respect brought to the pulpy material by a cadre of distinguished actors. How about an Oscar winner and three nominees? None of them show up in Marlon “Superman” Brando or Anthony “Odin” Hopkins mode just to pick up a paycheck. They are invested in their roles, especially Benedict Cumberbatch who’s lightyears better here than as faux Khan in Star Trek into Darkness. The only one who disappoints is Rachel McAdams and that’s because the script doesn’t give her anything substantial to do. All of the visual razzle-dazzle needs a great score to keep pace but, sadly, Michael Giacchino’s efforts aren’t up to snuff. The music sounds like a slightly reworked version of what he turned in for 2009’s Star Trek. The similarities are so striking that I half-expected someone to start intoning “Space, the final frontier…” It’s jarring to be watching one movie and hear music that’s familiar from another one. For those who care to play along at home, Doctor Strange posits some ideas about the intersection between magic and futuristic science. Many of the concepts about multiple dimensions and time travel are offshoots of current scientific theory and the film makes a case for the idea that any advanced technology will be indistinguishable from magic. 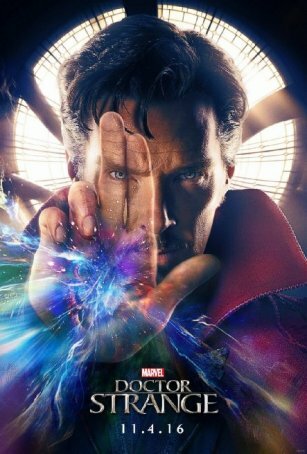 Is Doctor Stranger a Sorcerer Supreme or has he merely mastered quantum mechanics on a practical level? Apparently, Derrickson has a deep and abiding love for the character of Doctor Strange and it shows in his treatment. Although this falls far from the 2016 superhero pinnacle established by Deadpool, it’s a significant step up from the two Warner/DC debacles and even Captain America: Civil War. The film understands when it’s necessary to get serious but also contains comedic bits that aren’t forced or artificial. The Avengers are referenced, but they are mostly absent from the movie, allowing Doctor Strange to evolve without their interference. Finally, although the comic book tropes are all in place, the acting, tone, and visual effects keep them from becoming tedious. This is yet another solid building block in the foundation to Marvel’s ever-expanding superhero fortress.